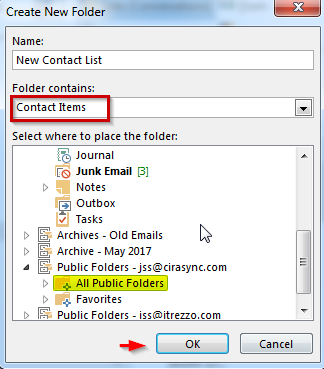 If your organization has public folder capabilities, we have put together the steps to create a Public Folder of contacts. If you have done this before, there wont be any particular tricks in this post. It is just a simple step by step guide. 1. Go to Outlook Navigation Bar, Click on the three dots and click ‘Folder’ to go to Folder View. 3. Select ‘Contact Items’ under Folder Contains, create a Contact List name and Click OK.
4. Select the newly created Contact Folder under Contacts (In this case, newly created Contact Folder is named ‘New Contact List). 5. Double-click or right click and select ‘New Contact’ to add one. 6. Enter all the important information for a user contact record then click Save & Close in the upper left. 7. To edit the Permission level for each user who has access to the Contact Folder, right click to the Contact Folder and select Properties. Add a user and setup Permissions level for each. I always recommend trying to use Distribution groups instead of individual users. If someone adds a user to the group, they automatically get access to the public contact list. If you have multiple public folders, the groups are even more critical — you don’t want to manually set permissions on a dozen public folders when you can simply add a new member to a group. 8. Next, Edit the permission level based on your business requirements. Default refers to authenticated users within your company. We also recommend setting these permissions to None. We suggest adding explicit permissions for the users or groups that need access. Once you have this public folder established, you can allow users to view the contacts from smartphones using CiraSync. This procedure works for both Office and 365 and Exchange 2016.